Hey! I’m Claire Maxted from Wild Ginger Films, and this is my personal blog all about my fave topic – trail running! I live in Stamford, Lincolnshire because of my job and family, and I love the running club there, but I have to admit I pretty much die if I don’t run or walk regularly in the mountains, so I’m often driving along in my van listening to running podcasts on route to the Peaks, Snowdonia, Lakes and Cairngorms/Glencoe. My main mission in life is to get as many people as possible enjoying exercise as possible, and loving the outdoors & natural world. I’m a qualified Personal Trainer too. I’m a strong believer in gender equality, especially in sport as it gives so much to all, and I’m very keen on working sustainably with the environment that we find so beautiful and enjoy running through. Find a local running club, join it, make friends with the people there, then go, every week religiously, without fail. Tuesdays with the Stamford Striders are sacrosanct for me, and often hills on a Thursday too. For some reason, although I love running, at the end of a mentally hard day at work I never want to go, especially if I’ve done a lunch time gym session, but I always do. I know I’ll enjoy it when I get going – catching up with friends, pushing myself, but coming home is when the benefit really starts. You finish buzzing, relaxed and happy. It’s like drinking a glass of wine without the hangover. 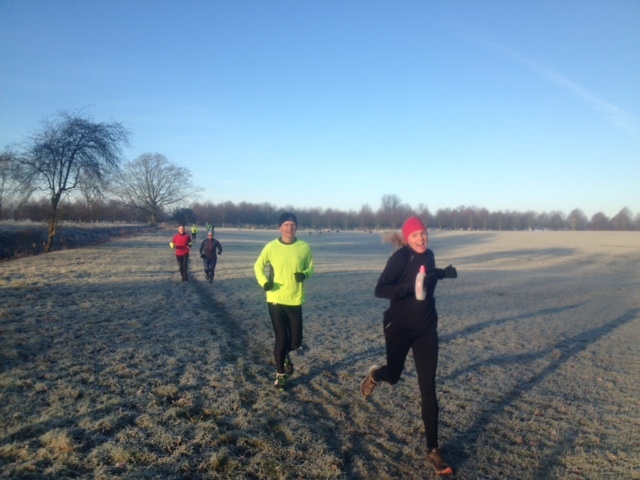 Stamford Striders LSR (Long steady run) last Sunday. I then went on to run a further 8 miles on my own to make it 20. That was a motivational challenge and a half! Did it though. If you aren’t already in a running club, find one and get involved, you’ll see so many improvements – not just enjoying running, but your speed and endurance will skyrocket too.